Such a cutie, great interpretation of the sketch. This is beautiful, love your interpreation of the sketch too. Too cute! Perfect for the summer! Great design! Thanks for sharing it with us at Lil Patch of Crafty Friends! Nice to know someone else is having a summer like us now. Our heat index for tomorrow is something like 108. Not good! It really would be nice to cool off at the beach like this little beauty! LOL! She's hilarious! Cute as can be and I love your card. The burlap bow gives it that extra touch. So cute!! Adorable little image and I love the elegant die you used to frame her! Thanks for playing with Jo's Scrap Shack. NC- this is so cute, and I cannot imagine 80 one day and 100 the next!!! We had almost 100 and humid over Memorial Day- it was a killer! We had a wedding outdoors, then the reception indoors (thankfully!). Ha, ha Connie! What a fun card - and that little cutie look a bit like our Mrs A, all ready to take a dive into the Playground duck pond :) Don't tell her I said so though. A real fun card! 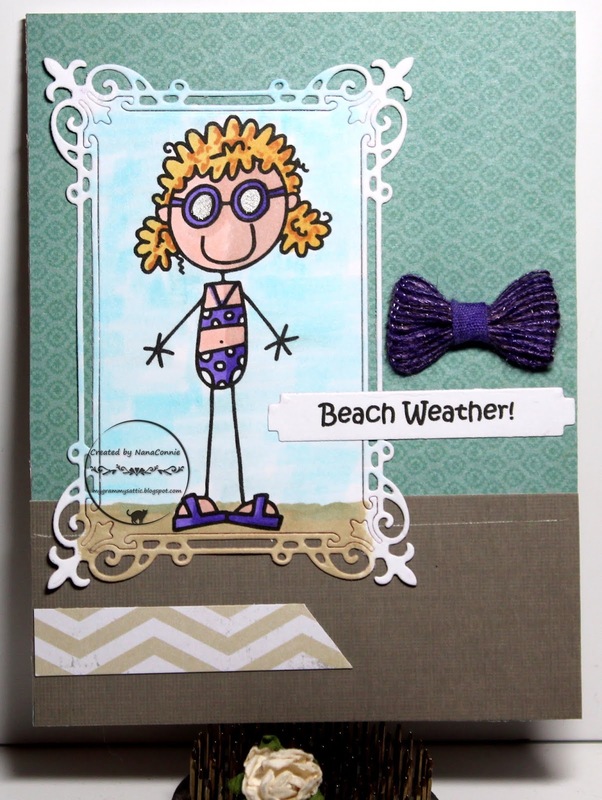 Thanks for sharing your make with us at Stamping Sensations! Great card. Love the image . Hugs Mrs A.
Wow, what a great card, thanks for playing along with us at Catch The Bug. Love hour card thanks so very much for joining our June Anything Goes challenge! Hope to see you again soon! Too cute! :) Thanks so much for playing along with our latest Bugaboo Stamps/Catch The Bug Challenge. We hope you'll join us for our newest challenge this week!